Licensing properties from other media has a long tradition in Pinball games. 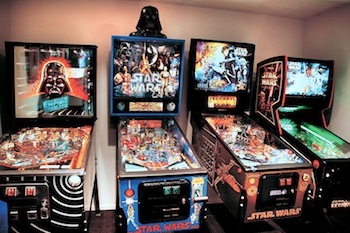 After all, every pinball machine needs a theme, and established works are a convenient source. Nowadays, with the rise of home video game consoles and the decline of arcades, almost all new tables are licensed games, as they provide significant name recognition for curious new players. Even hobbyists recognize the draw of a good license; many home-made games have been based on popular pop-culture icons including Ghostbusters, Star Fox, and The Matrix. Pinball Spinoff is a related trope for pinball games based on Video Game properties. Licensed Game is the video game equivalent trope. Also see Physical Pinball Tables and Digital Pinball Tables. 3-D Ultra Pinball: Thrill Ride is technically based on the Real Life Hersheypark Theme Park in Hershey, Pennsylvania. Alien : Under development by Dennis Nordman for Heighway Pinball, scheduled for release in 2016 in both regular and "35th Anniversary" editions. Rob Zombie's Spookshow International: The second game from Spooky Pinball,note after America's Most Haunted and their first licensed game. With custom dialog and ten songs from Rob Zombie himself, and a limited edition set of 300 games with artwork by Alex Horley.